The Norwegian royal family welcomed the President and First Lady of Iceland for a state visit yesterday. Crown Princess Mette-Marit made some interesting sartorial departures, I guess you could say. Click here for videos from the dinner. 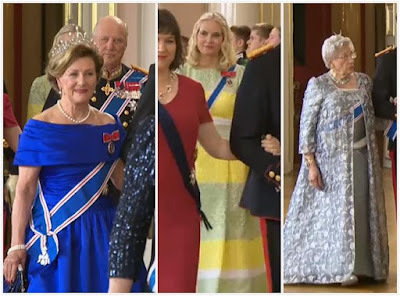 The tiaras on parade at the evening's state banquet were Queen Maud's Pearl and Diamond Tiara (Queen Sonja), the Diamond Daisy Tiara (Crown Princess Mette-Marit), and an aigrette (Princess Astrid). I really didn't need to tell you which one goes with which lady, did I? Nope. Standard picks all around. ...THIS. This is a most perplexing frock. I actually love the shape for her. There's a little train on the skirt to take it into definite gala gown territory, perfect for tiaras and orders. So, why select colors that have so much color clashing potential? I mean, they're soft colors, but they don't go with a whole lot. Even the basic dark blue of the Icelandic Order of the Falcon feels jarring. 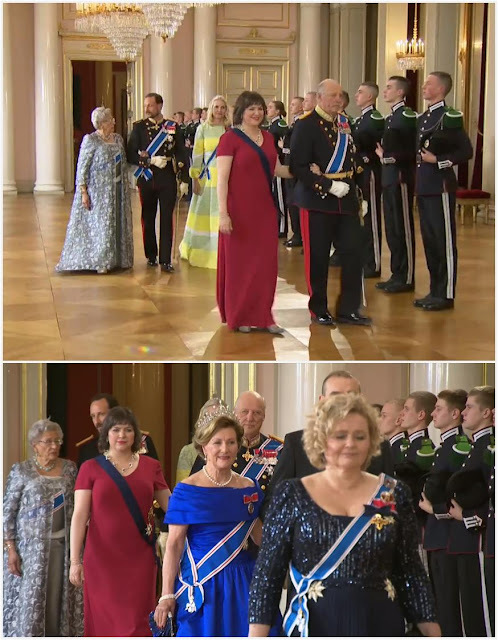 The red of Norway's sash would have been worse. MOST PERPLEXING.